Ian trained at the Australian Ballet School and danced and choreographed with The Australian Ballet, Australian Dance Theatre and the Dance Company of New South Wales prior to moving to London in 1977. In London Ian performed with Richard Alston and dancers and started his own ACE funded Ian Spink Group (1978-82). 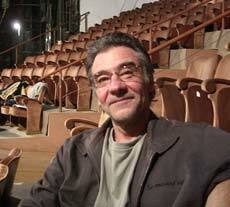 In 1982 he co-founded Second Stride Dance (1982-96) Company with Siobhan Davies and Richard Alston. In 1988 he took over sole artistic directorship of the company with Antony McDonald as associate director, and initiated a move in the company's output towards experimental multi-disciplinary dance and music theatre. He directed nine full-length works for Second Stride, commissioning writers, directors, designers and composers including Caryl Churchill, Sian Evans, Tim Albery, Martin Duncan, Peter Mumford, Lucy Bevan, Antony McDonald, Evelyn Ficarra, Judith Weir, and Orlando Gough amongst others. Ian's freelance work has included directing (Citizens Theatre, Scottish Opera) choreography and movement directing (Rambert, ENO, RSC, RNT and Opera North) as well as leading creative workshops. He is a dance Advisor for the Scottish Arts Council. Ian has recently presented '3 of 26 Solos' at the POOL performance in Dundee and is choreographing Petrushka for Scottish Ballet, which will premiere at the Edinburgh International Festival in August.